The winery is owned by Andrew Hood who also makes wine for several other Tasmania wineries including Frogmore's sister label, 42 Degrees South. Established in 1996 on gentle sloping land in the Coal River Valley of southern Tasmania (Australia), Frogmore Creek bottled its first vintage in 2002. The Reserve Pinot Noir from that year won the best Pinot and the Best Wine of Show at the 2004 Tasmanian Wine Show and was awarded 96 points by James Halliday in his 2005 Australian Wine Companion. In 2003, Chardonnay and Riesling joined the flagship Pinot Noir. The Frogmore Creek 2005 Pinot Noir received the Chairman's 'Best of Class' at the 2007 Long Beach Grand Cru Wine Competition and a Gold Medal at the 2007 Los Angeles International Wine and Spirits Competition. The Coal River Valley region is an award winning wine producing area with a similar latitude to the famous wine regions of France and Germany. Only a 20 minute scenic drive from Hobart city, Frogmore Creek lies amongst the largest concentration of privately owned vineyards in Tasmania. Tasmanian winegrowers have used the cleanest air in the world, the purest mountain water and the four distinct seasons of the mid-southern latitudes to produce premium quality wines for a world market. 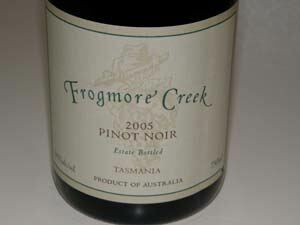 Frogmore Creek was a participating winery at the 2008 World of Pinot Noir. Small amounts are exported, and at a relatively inexpensive price, this is a wine to purchase in quantity. Tasmania's climate produces wines more like those of Europe than mainland Australia. Highly recommended.